Although I was married in 1959 it wasn’t until 1971 that my circumstances caused me to recognize that I was in serious trouble. So much so, that it forced me to recognize that I needed to do some deep soul-searching and challenge myself. I was staring at a disaster; caused by conducting my marriage from my perspective. All the time, God was patiently waiting for circumstances to drive me to a place where I would turn to Him for direction. The time had come for my Christianity to become more than mere words and theological habits. I needed to search out; re-evaluate my life and then pursue God’s goals for my life and marriage; which I discovered, meant becoming more and more like Christ to my wife and children. I needed to accept the responsibility (as the spiritual leader in my home) to lead as Christ would. Those are also the ultimate purposes of this book. To accomplish those purposes, here are Five Challenging Concepts (which are like spiritual seeds for the gardener who wants spiritual growth) all of which I believe God revealed to me and to which I hold myself accountable. These concepts (or spiritual seeds) yielded for me and I believe will yield for every Christian man… the same brand of Christianity the Apostles died for. These concepts presented me with a challenge, and I’m passing that challenge on. Are we willing to become the Christ-like spiritual leaders in our homes that God requires we be? Not so incidentally, that requires an intense commitment to God. A commitment wherein we will need to determine; are we willing to pay the sacrificial price required to gain the necessary understanding that will enable us to become more and more Christ-like! God is going to bring every man to a place where he will have to decide; am I willing to accept the challenge of literally illustrating Christ. Exemplifying the ability to respond to all of the events in my life as Christ would? Let me take this opportunity to mention, it definitely is the intent of this series of books, to present every Christian man with a challenge: The most demanding concepts he may ever face; requiring that he meet some of the strictest opportunities for illustrating Christ in his Christian home (and community) he may ever be confronted with. 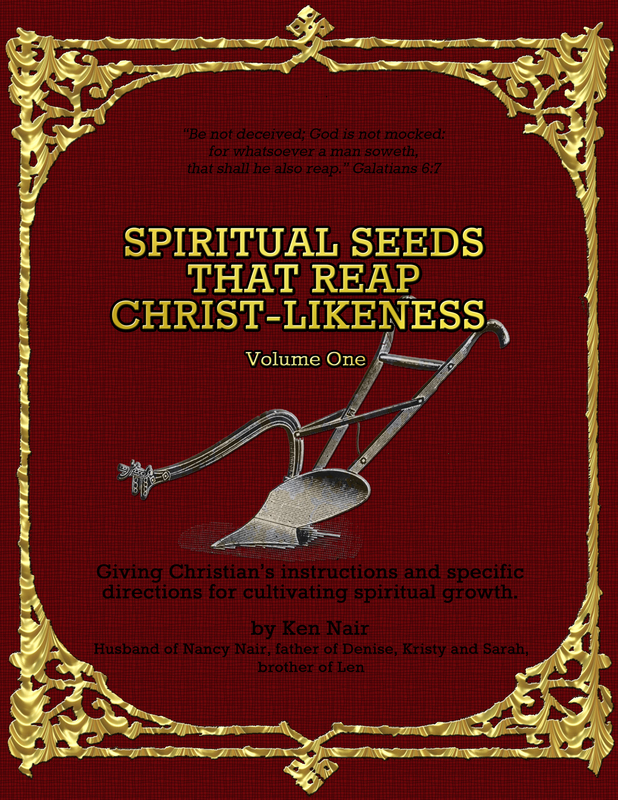 SEED #1, answers this question: What needs to happen before a man can prove he understands his own human spirit well enough that he would be qualified to be a Christ-like spiritual leader? Proverb 25:28 requires that a man understand his own human spirit; warning him about the trouble he will encounter if he does not have, “…rule over his own spirit.” (KJV) If we do not recognize, nor specifically understand, our own human spirit, how is it even possible that we could build spiritual maturity in ourselves or in those we are supposed to be spiritually responsible for? SEED #2, answers this question: What is specifically involved in dying to self; how does a man put his own “flesh” to death? II Cor. 7:1 clearly instructs us to, “… cleanse ourselves from all filthiness of the flesh and filthiness of the spirit.” (KJV) Do we know how to recognize our flesh in all of its manifestations? Do we even recognize when and how our flesh manifests itself in our everyday lives? Knowing these things enables a man to understand what is necessary to put his flesh to death, and allows him to acquire greater spiritual strength. SEED #4, answers this question: What is involved in a man developing the ability to actually illustrate Christ to his wife, every day in his life? We know that Christ was/is, spiritually mature! And, Ephesians 5:23-27 requires that we be like Christ to our wives; Romans 8:29 also requires that we be conformed to the image of God’s Son. If we are struggling in our marriages, and the evidence clearly illustrates that there is a lack of harmony and oneness, then Christ-likeness in a husband (the spiritual leader) is missing. What resources will we draw upon to discover when, where or how we are not Christ-like? What resources will we use to help us discover how to discipline ourselves, so we would more effectively illustrate Christ not only to our wives but to everyone? How about drawing upon the help that God ordained for us? Do you know what that help is? SEED #5, answers this question: How does a man successfully discern God’s intentions and directions in every situation? Can he interpret all of life’s physical events, in such a way that he is able to turn them into beneficial spiritual lessons? Thereby, daily, being an example; leading his family into victorious living? Romans 8:28 says, “…all things work together and are [fitting into a plan] for good …” (AMP) What is the evidence that we specifically do understand, what the good is, that God wants to accomplish in everything that take place in our lives, daily? If we are going to be an illustration of Christ to the world, doesn’t it make sense that we would have to learn these Five Concepts (plant these Five Spiritual Seeds in our own spiritual lives) before we could teach them to others? Doesn’t it make sense that we cannot bring stability to the Christian community without personally providing the kind of spiritual leadership (especially in our marriages) that Christ would? Doesn’t it make sense that we cannot bring stability to Christian marriages if we do not understand our own wife’s heart/spirit so well that in each situation we face in our marriages, our wives feel as though they’ve had an encounter with Christ? Doesn’t it make sense that we cannot offer the hope of stability in the homes of other Christian, unless we are the kind of Christ-like example in our own home that brings stability? That, like Christ, we would know our wife’s spirit so well that we know what our wives would be thinking in a given situation? We aren’t guessing or thinking we know… we know! And, our wives will readily testify that we do indeed, know what their thinking would be in a given situation? Doesn’t it make sense that we would not be able to pass on the necessary knowledge or specific understanding about the human spirit, if we don’t thoroughly understand our own human spirits, nor our wife’s spirit? Now, having said all of that, may I propose that the most significant means God has devised; so we could develop spiritual understanding and leadership, is found within the framework of the home… marriage! It is the most challenging institution for building relationships! Marriage is the first institution that God Himself established. His purpose is, that it is the most significant and demanding resource for training a man to illustrate Christ. Marriage presents circumstances wherein a man’s true nature and character are revealed. Then, as necessary, he can alter his normal-to-man character; that it be conformed to Christ’s character. Marriage is also meant to be the most rewarding relationship in the world! Concerning this role of spiritual leadership and how serious God is about it: read Malachi 2:13-15. (NASB) In it, God explains what His expectations are of spiritual leadership; expectations that require a high degree of spiritual awareness, along with a complete ability to understand our own spirit and the spirits of our wives. Then, we can successfully provide Christ-like care for our wives and others.